Hi, Gede, thanks for stopping by, and thank you! Have a wonderful rest of the week. 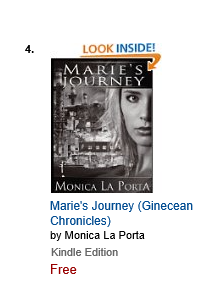 Hi Monica – I’ve grabbed my copy & btw, “Marie’s Journey” is now #2! Whoop whoop! Hope this one goes all the way! Julia, thank you so much for all your support! Let’s cross fingers!